With the suspended sliding door it is possible to create spaces in a smart way. Thanks to this system of sliding doors for divisional interns it is possible to organise new areas that can seem unusable at first. 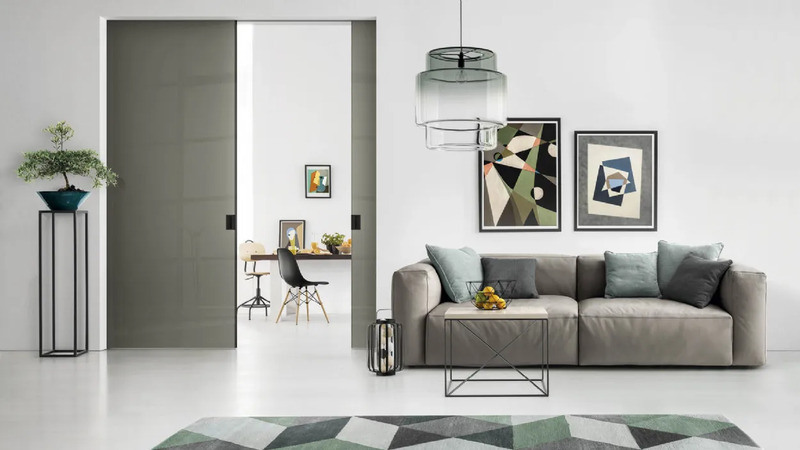 This system of suspended sliding doors does not leave any spur in the floor and is used in modern houses, but only if the walls and the ceiling are supporting. The choice of suspended sliding doors therefore leaves great freedom of use even in the most difficult to furnish houses. Suspended doors can be requested with one or more doors and are made of glass, decorated glass , polished or satin glass or lacquered finish. The doors available for this system have an aluminium structure combined with a panel or glass and can be applied to various brands of existing counterframes. Finally, the traditional Doal retractable doors are equipped with aluminium jambs that act as a frame for the passage compartment. The frame can be combined with the door frame and is available in silver, stainless steel, white and brown. Thanks to the sliding system, the same surfaces that, in the case of a traditional hinged door, would instead be occupied by the opening radius, can be used for maximum usability. Doal offers models in wood, glass or glass with aluminium frame. The transition from one room to another is extremely fluid and flexible, creating a structural and stylistic continuum that gives the house a modern and elegant appearance.